Himalayas Day 19 – Lukla to Kathmandu!! 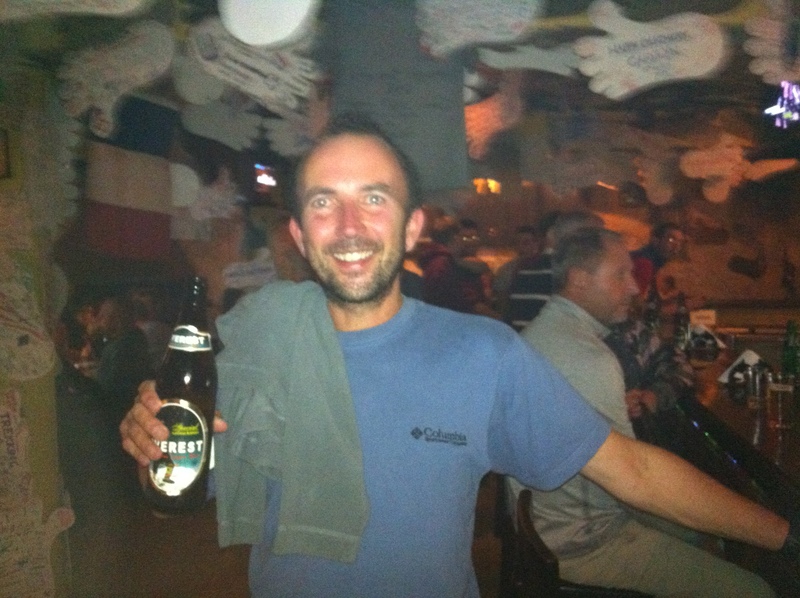 So after last night’s tipping ceremony (it’s now Monday, 7th November, and I have been stuck in Lukla for a ridiculous six days now) for the Sherpas and guides, and a very sore head due to the rum and beer consumed, I woke up at about 5am. Daylight was trying to appear, and I could not tell at first whether it was the customary cloud and fog, or just early morning mountain mist that clouded my view. Determined that somehow I would escape this place somehow today, I decided to get up, pack, and see what the day brought. Within perhaps 20 minutes or so I was actually greeted with, guess what, a sunrise! Hallelujah! The mountains around us (yes they are still here, despite being entirely invisible for six whole days) had been dusted with a light covering of snow, and we could see right down the valley! It was all too much – would this be the day? It's a miracle - there is actually a sky up there! By about 6.15am the dining room of the lodge was full with expectant people, when, lo and behold, a plane flew in to the runway! Out lodge (although we wouldn’t have known it the last few days) actually overlooks the precariously sloped runway, and then the tiny plane landed you would think that everyone had just won the lottery – there was cheering and shouting and jubilation all round, which made it very exciting indeed. Within about 10 minutes, Val from Exodus told me to have my bag packed and ready for 7am, and said that I ‘might’ get out on a flight if I was lucky. I didn’t need to be told twice, and my bag was duly ready and waiting within minutes. During this time, the sun kept singing and the planes kept coming. By about 8am, after nervously waiting and watching as certain people began to get called to go the the runway, it was all of a sudden my turn! I could scarcely believe it was happening, and actually and resolutely refused to, until I knew I could actually get on a plane and it had taken off. The others from my group watched me I suspect somewhat jealously as I made my way out, as I had been given priority over them as I had been on the waiting list for six days. Bidding them goodbye and wishing them good luck to get down during the day also (hopes were high for everyone so good was the weather in fact) off I went. And we can see the runway - yippee! I ended up with a group of sixth formers and their teachers who had also been up to Base Camp with Exodus at the same time as us. They too had been in the lodge in Lukla the same amount of time as me, and they had been incredibly patient. 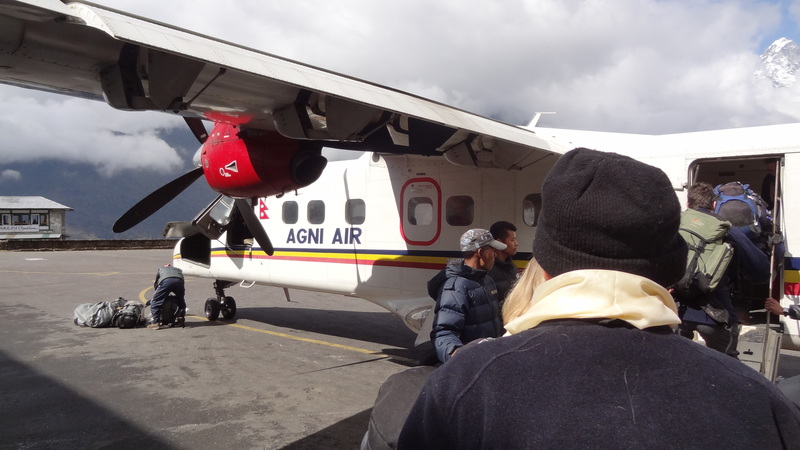 After waiting for some time in the departure ‘hall’, the sixth formers got their break – they would all get onto the same plane and fly off down the mountain. How jealous was I then! Within a matter of a couple of hours of thinking ‘will it or won’t it’, my chance finally came at just after 11am. 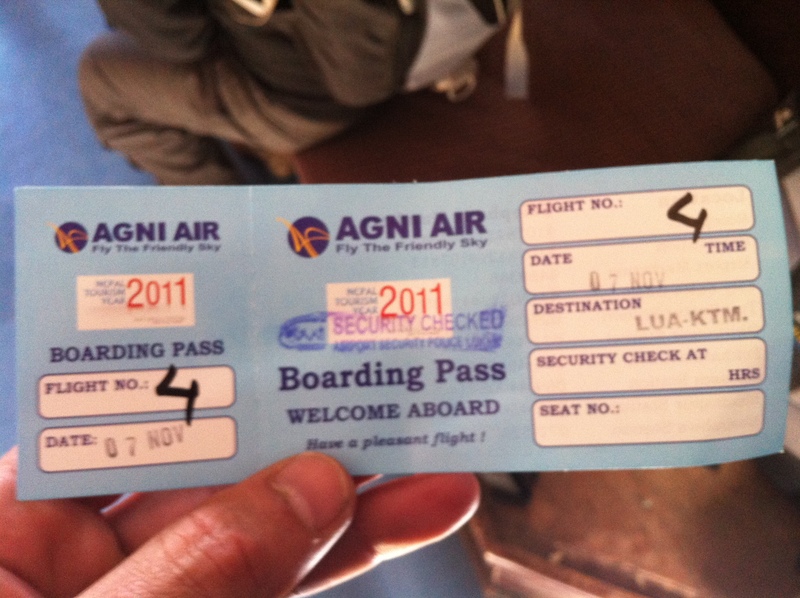 My Agni Airways Dornier plane came rushing up the runway, and in no time at all I was clambering abroad. This felt like a winning lottery ticket, believe me. I almost had no time to be scared at the take off, for when the plane lurches forward down the slope you fear there is no way the thing will lift off at all, never mind get up in time to not hurtle straight into the hillside opposite. But take off it did, and missed crashing into the mountains opposite also, and then I was up in the air – I had escaped! ..And finally I get into one too - get out of my way!! 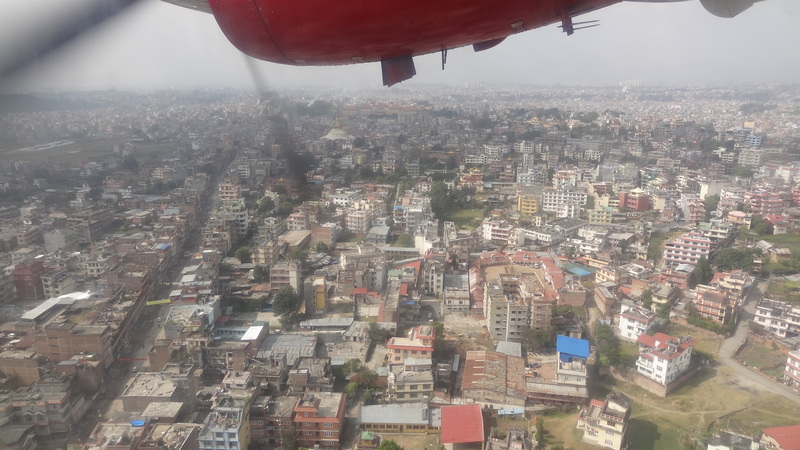 After a slightly bumpy flight, I was so happy to get onto the ground in Kathmandu. What an amazing shock also to see so much traffic and congestion! After 17 or 18 days in the wilderness where the only traffic is the occasional Yak train, to see so may cars and buses was a nightmare, and I (despite wanting to get away for so long) immediately longed to be back in the clear mountain air. Approaching Kathmandu from the air at last. After a three quarter of an hour slog through the fumes of Kathmandu in a taxi, I was back in the Royal Singi Hotel. Sadly they didn’t have a room for me, as there was still a backlog of people trying to get up to the mountains as well as away from it, and so I got sent to another hotel temporarily. The shower when I hit my room was even better than the one I had when I went to Kilimanjaro! I actually managed just one shower in the Himalayas, and whilst I was pretty diligent with the wet wipes on a daily basis, you cannot believe just how good it is to wash your hair and body and stand under hot water for half an hour. Bliss! 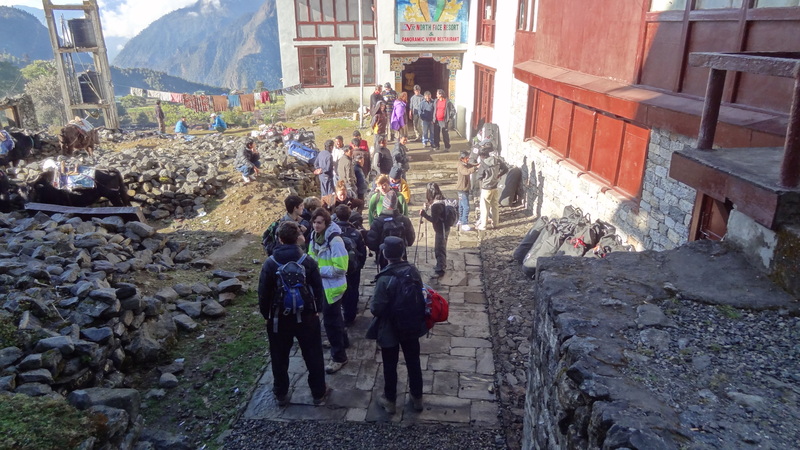 About two hours later I was back in the Royal Singi, and delighted to see two of my fellow trekkers, Tony and Stefan, who had also just made it back from Lukla. They had been lucky enough to get two places on a rescue helicopter, having drawn lots with the others for the privilege of doing so. They said the helicopter flight was fantastic, but I would have in the end been glad to leave by camel if it would have got me out of there. The others would unfortunately not make it back today, but hopefully would get a flight out in the morning, the weather forecast now being entirely clear and sunny for the rest of the week. 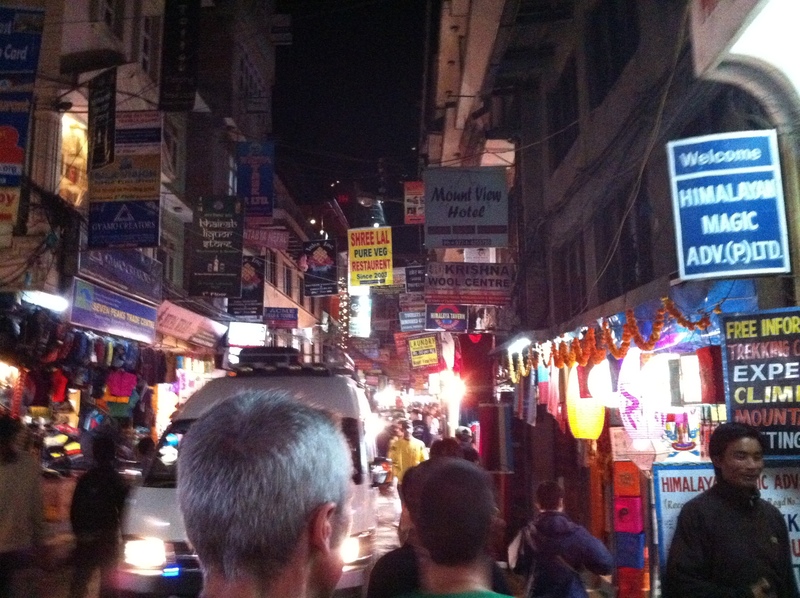 Having donned shorts and flip flops, the three of us ventured into Thamel, the bustling shopping/market/nightlife side of Kathmandu for some food. We found ‘The Everest Steak House’, and pigged out on meat for the first time in a fortnight (it’s recommended not to eat meat up the mountain even if you do come across it in a lodge, as it won’t be quite digestable to the western palate) in the midst of a three course meal completed with Apple Strudel and ice cream. Mamma Mia! On our way home we stopped in for some beers at The Rum Doodle, the famous bar where all Everest Summitteers sign the wall, and where there are many tributes to previous Everest expeditions. The Rum Doodle - never has a beer been more welcome! Perhaps the best thing of all was yet to come this day – a proper bed! This was the first time again in 17 days that I would be able to put my head on a pillow, and to not sleep in a (now damp) sleeping bag. Absolute luxury! 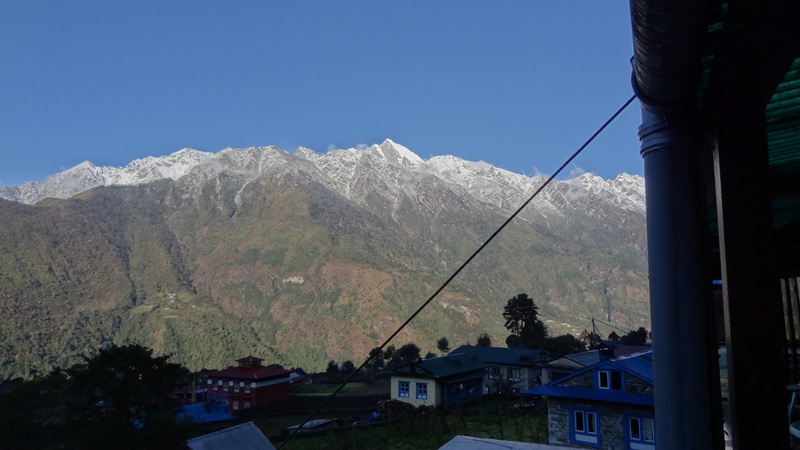 I went to bed very content indeed, so glad to be out of Lukla, and yet already missing it. I could now reflect on all that had happened to me, which I will share on another occasion. For now I hoped that the rest of the party would get down safe in the morning, and I began to look forward to my return to ‘civilisation’ in just two days time. Goodnight! Day two in Kathmandu starts with breakfast at a fairly civilised 8am. I am tired as I had a bit of a fitful sleep due to having the window wide open all night, which in itself was entirely necessary due to the air conditioning in the room seemingly pumping hot air out instead of cold, and the dial not making any difference no matter which way it is set. Outside you can hear dogs, monkeys, endless traffic and all manner of other strange sounds. It is all so different too that it makes you want to listen to it and try to make sense of it all. After breakfast we meet Ngima, who then does a full briefing with us. We have to get our trekking passes issued, and then he explains the route to us for Everest Base Camp and Island Peak. The journey will differ slightly it seems from the trip notes, but for the better. He gives us a map each which has been highlighted and noted where we will spend each day. We will spend two days around Namche Bazaar it seems, which is great, as this will be the first night at altitude proper (above 3,300m). Whilst there we will also get to spend time at the Edmund Hillary hospital, which actually makes me really emotional thinking about it for some reason. We will also I think get to spend the 8th night at Everest Base Camp! This is so unexpected (whilst EBC was always part of the route it was due to be a very fleeting visit) it about floors me, and I have to look out of the window as I think I am welling up. We will also spend just two or three nights now (as opposed to what I thought was four) in tents on the glacier at Island Peak, which still seems like a long way away for some reason, probably because it is. 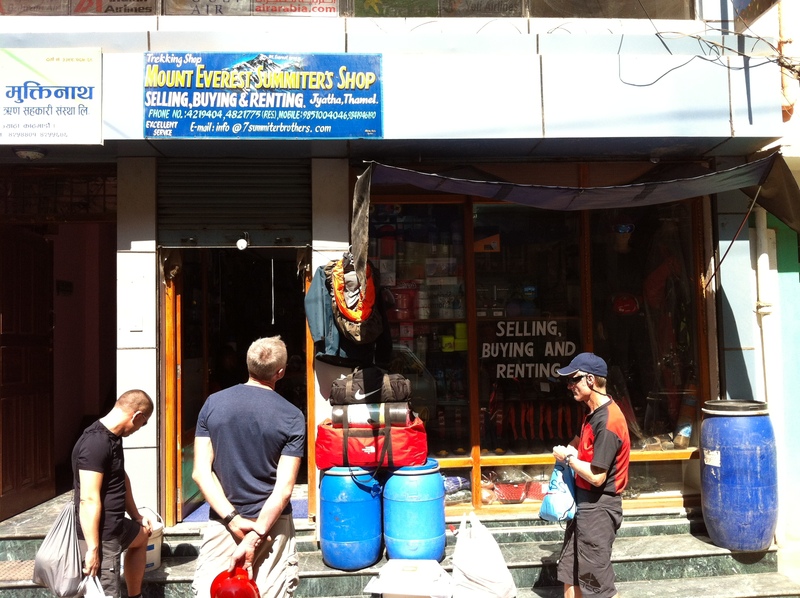 After breakfast we head back into Thamel, to ‘The Summit Brothers’ mountain hire shop. And the 'Summit Brothers' Hire shop. We are duly decked out (for those of the group who don’t already have them, which is about half) with plastic boots, crampons, ice axes, helmets (mine looks like it is off a building site and it is suggested that I look like Bob the Builder) and the like. We have to pack all of our Island Peak equipment separately as it will be taken today to Everest Base Camp and we will thus not see it again on the trek until the climb itself. After a leisurely lunch of pizza in Thamel, we go back and pack for the trip proper. Everything has to be sorted into four bags. One for Island Peak with the climbing stuff, one for the trek with all clothes, sleeping bag, toiletries etc, one day bag/rucksack with waterproofs and camelbak and the like, and then anything else is left behind at the hotel so that you have a clean set of clothes to change into when you return from the Himalayas. 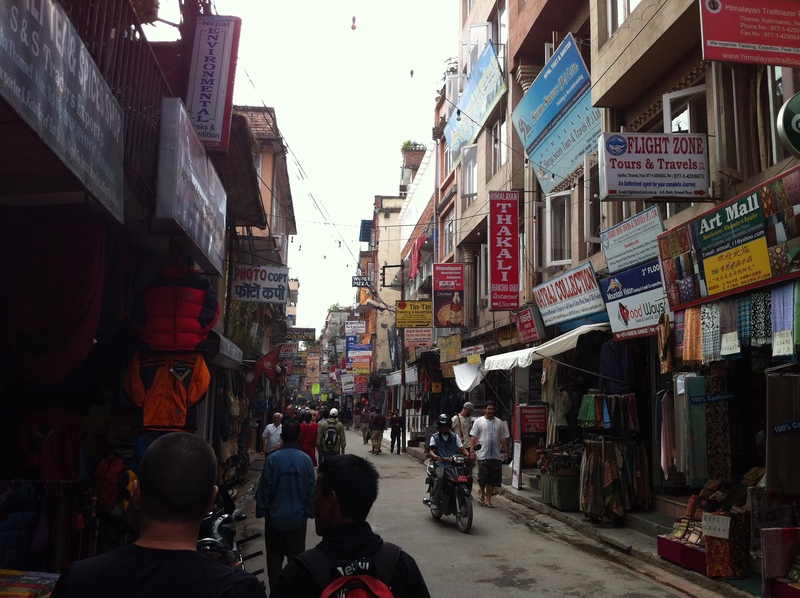 As I am packing I realise that I have forgotten to pack my Camelbak, and so I head back into Thamel again to buy one. After a bit of haggling I get a rather cheap and nasty looking one, which is probably because it is actually cheap (about 8 quid including an albeit flimsy insulating tube) and nasty, and I hope will last the course. 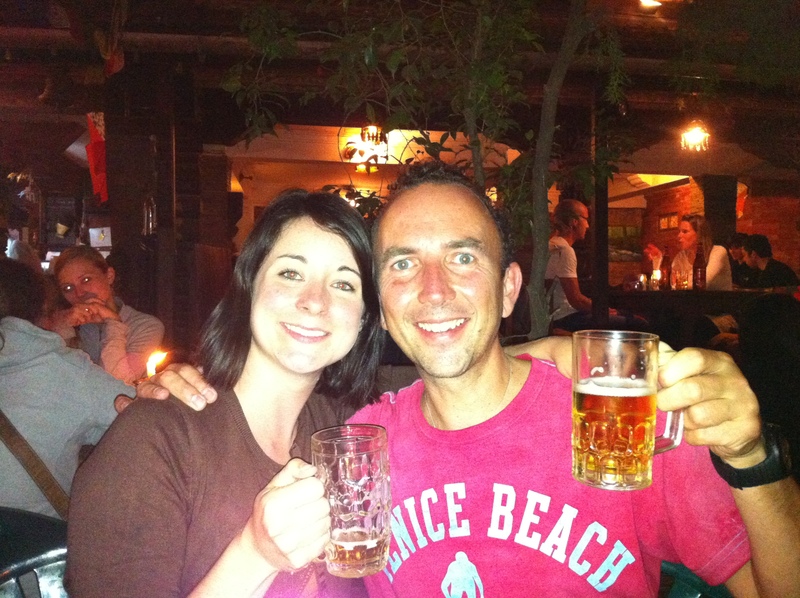 Lou and I at 'Old Orleans' restaurant in Thamel, much recommended if you are down that way. I get back to the hotel rather later than I should for what will be a 5am start in the morning, but nomatter, it was so good to meet up, and I actually wish afterwards that I had stayed longer. Tomorrow though is effectively here already. At 5.30am we will head to the airport to fly to Lukla. 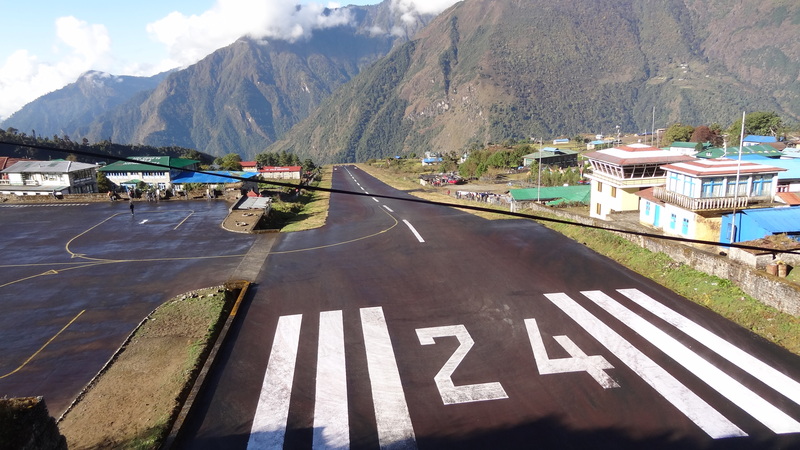 I have been dreading this flight for some time to the world’s shortest runway, banked at 15 degrees. 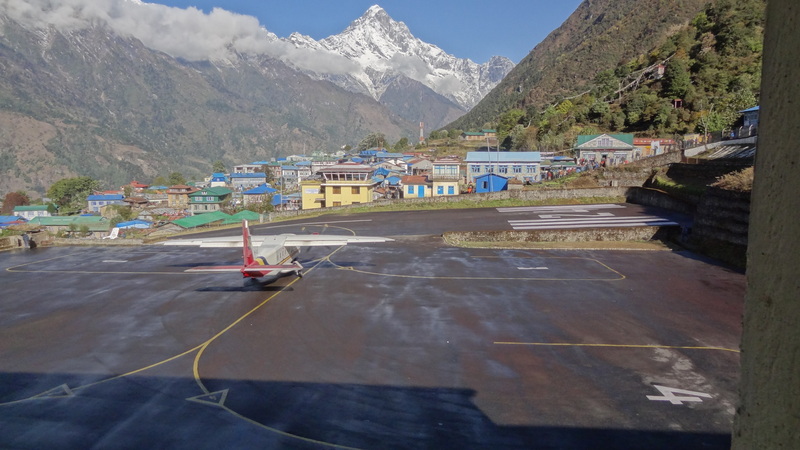 Then shortly after arriving at Sir Edmund Hillary airport, (which sadly and ironically claimed the lives of his wife and son in a crash landing there) we will start walking right away, towards Everest. I will at last be on the path of giants, the same path that Edmund Hillary himself took in fact. The trip is now on, well and truly.